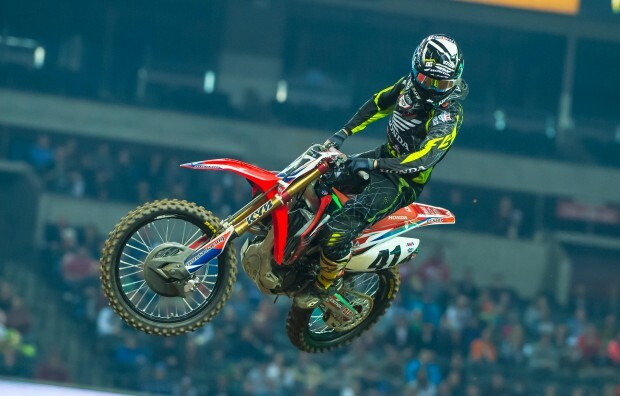 Round 8 of the AMA Supercross series marked the first of two back-to-back stops at Atlanta’s Georgia Dome, and for Team Honda HRC it also marked the point at which Trey Canard advanced to second place in the points standings, thanks to yet another podium finish. In addition, Cole Seely… read more. 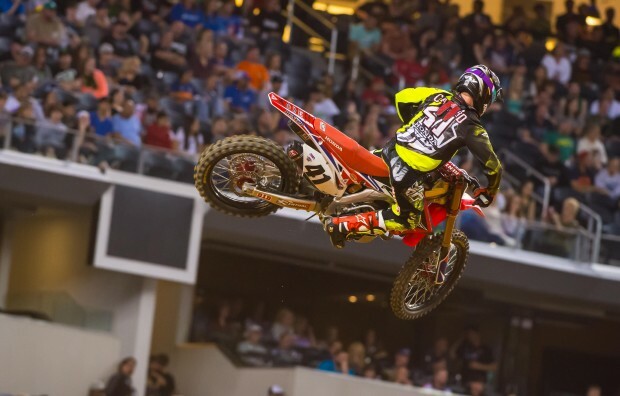 Round 7 of the AMA Supercross series in Arlington, Texas, was filled with mixed emotions for Team Honda HRC as it saw Trey Canard follow up his second win of the season last week with a solid podium finish, while Cole Seely experienced multiple challenges to finish 10th. Following a… read more. 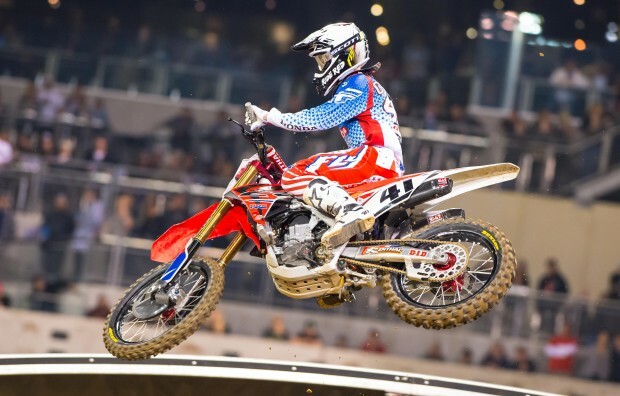 Team Honda HRC turned in a dream performance at round six of the AMA Supercross series, with Trey Canard leading all but three of the 450SX main event’s 20 laps to post the first premier-class Supercross win at Petco Field. The Oklahoman showed excellent racecraft in San Diego, emerging from… read more. 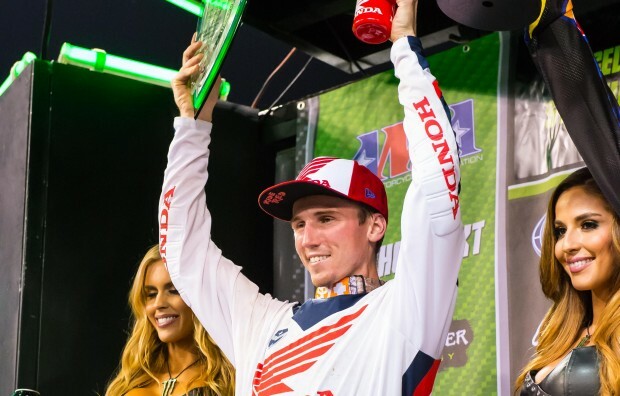 The 2015 season’s third and final stop at Angel Stadium of Anaheim was another big night for Team Honda HRC, as premier-class rookie Cole Seely rode to a runner-up finish, the best 450SX result of his career thus far. The unique elevated start proved no problem for the Californian, who… read more. 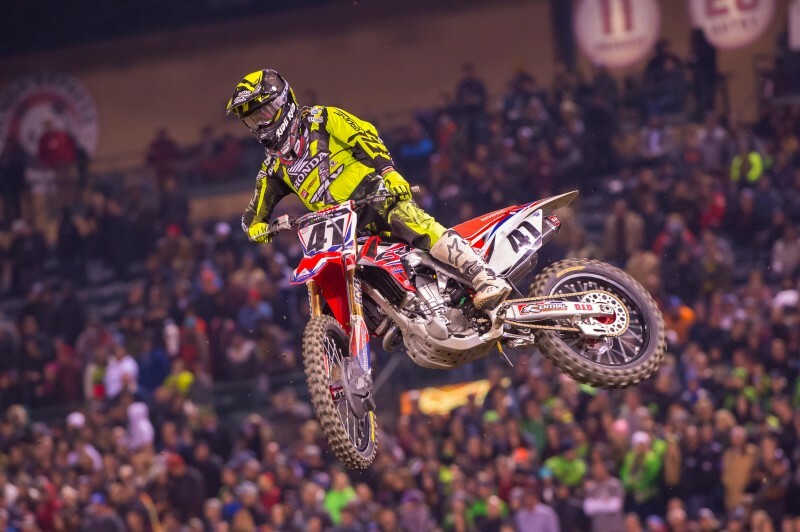 For Team Honda, Saturday night at O.Co Coliseum in Oakland, California, was filled with excitement and celebration as Trey Canard raced to his first 450SX victory in nearly four years. The Oklahoma native was unstoppable all day, topping timed qualifying practice and pulling away in the 450SX main event for… read more. 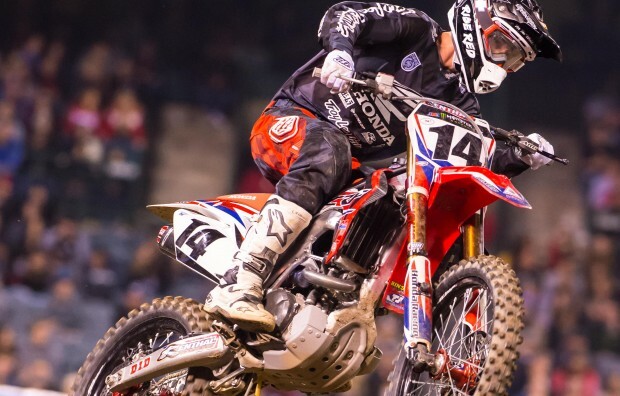 For Team Honda, the second of three 2015 stops at Angel Stadium of Anaheim was a rollercoaster of a night that saw both Trey Canard and Cole Seely involved in multiple encounters with other riders. Despite all the ups and downs, the team celebrated Seely’s best finish of the year… read more. 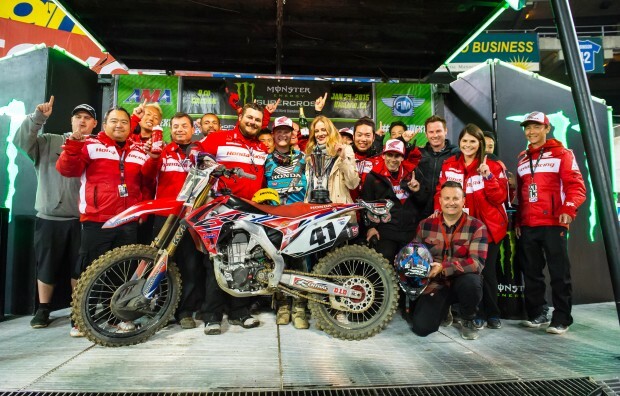 While Team Honda staff and riders Trey Canard and Cole Seely had hoped for a better showing at the Phoenix Supercross than ultimately proved possible, the squad’s spirits were buoyed by the inspiring debut premier-class victory of GEICO Honda’s Eli Tomac, who also rides a factory CRF450R. Canard’s bid for… read more. 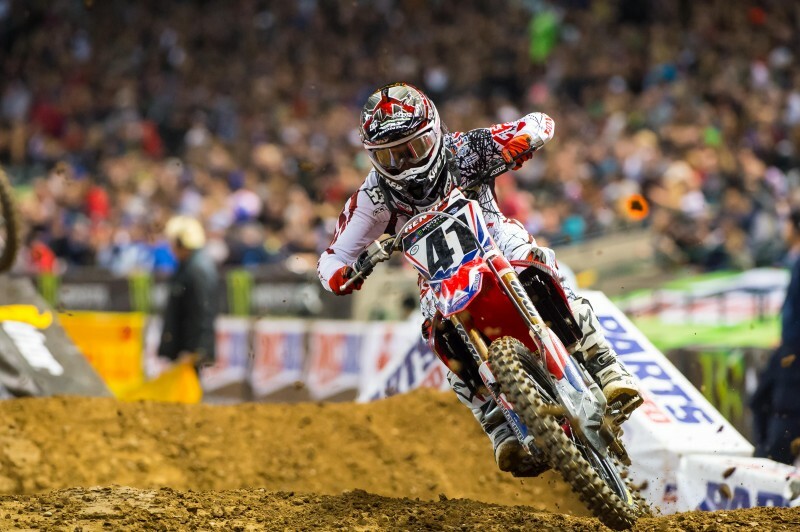 Team Honda kicked off the 2015 AMA Supercross series on a chilly evening at Angel Stadium of Anaheim, where they celebrated a solid podium finish by Trey Canard. The Oklahoman had an impressive showing, salvaging an eighth-place start in the main event by advancing to third place by the midway… read more. The 2015 AMA motocross calendar has now been announced with Hangtown back in the lead-off spot and Glen Helen remaining on Memorial Day with the season finale at Ironman Raceway in Indiana. Date Location State May 16 Hangtown Motorcross Classic Sacramento CA May 23 Glen Helen National San Bernardino CA… read more. 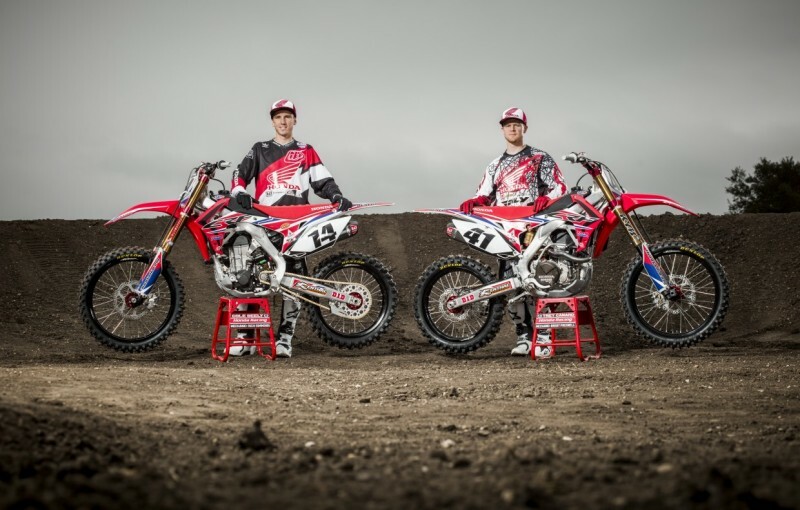 For 2015, Team Honda has a solid rider lineup that’s marked by both steady experience and fresh blood. Trey Canard, a veteran of the 450 class, is joined by Cole Seely, who is in his first full season in the premier division. Both are longtime members of the Honda family,… read more.